Contact us to reserve this item. This is an A. Gigliotti Clarinet Maestro 4. These are Gigliotti’s flagship product and these pieces are used by professionals around the world. It has a .047 tip opening. There are some intentional etchings on the bite plate, and there are some ligature scratches. Contact us to reserve this item. This is a Chedeville M. It has a .041 tip opening. There are some scratches on the body, but other than this the piece looks virtually unplayed. Contact us to reserve this item. This is a Chedeville M. It has a .045 tip opening. 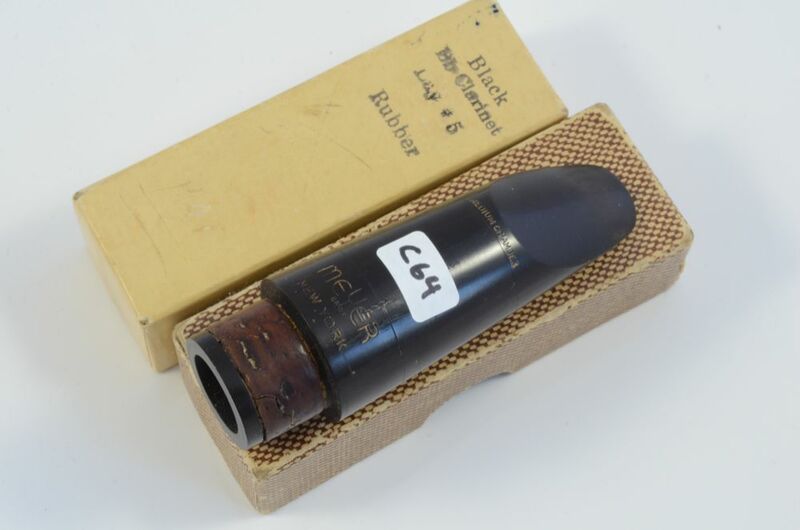 Other than a few scratches this mouthpiece looks virtually unplayed. Coming soon. Contact us to reserve this item. This is a Meyer Clarinet 3M. It has a .047 tip opening and is in great condition. It comes with a ligature and mouthpiece cap. Contact us to reserve this item. This is a Noblet 2V clarinet mouthpiece. It has a .045 tip opening. This piece is slightly discolored and has some wear on the bite plate. Contact us to reserve this item. This is a Selmer Goldentone clarinet mouthpiece. It has a .048 tip opening. There is some wear on the bite plate and the words are a bit faded, but other than this it is in great condition. Contact us to reserve this item. This is a Selmer Clarinet HS *. It has a .042 tip opening and is in excellent condition. This piece comes with a mouthpiece cap and ligature. This is a Selmer Clarinet S mouthpiece. It has a .048 tip opening and is in excellent condition. Contact us to reserve this item. This is a Woodwind Co. of NY Clarinet B5. It has a .035 tip opening and is in excellent condition.